During my strolls over the island I have noticed a number of uniquely formed trees. The boreal forest in Örö is relatively young. 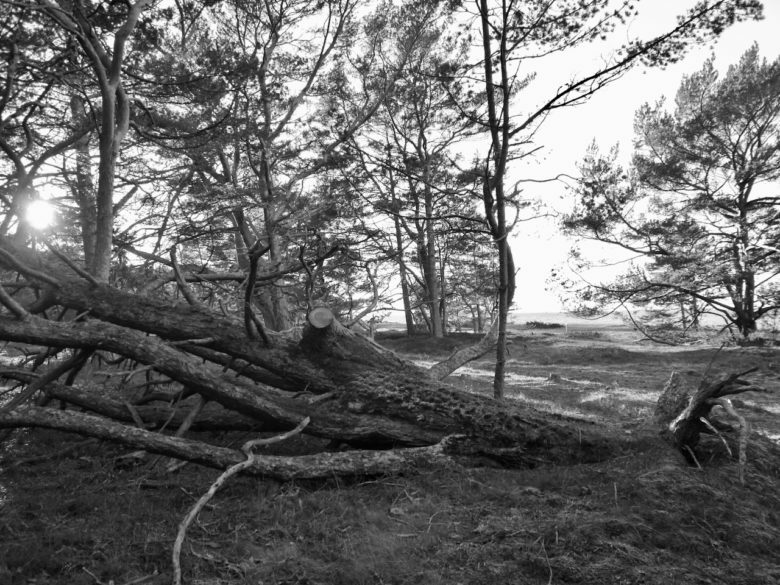 When Örö was first used for military purposes, the woods were felled. Aerial views from the beginning of the 20th century show a barren landscape with multiple military edifices such as harbours, dockyard, barracks, heavy guns, artillery positions, industrial buildings, stables, the road and even a short railroad track. Over the last decades, the forest and shrubs were allowed to regrow; woodland quickly spread out. 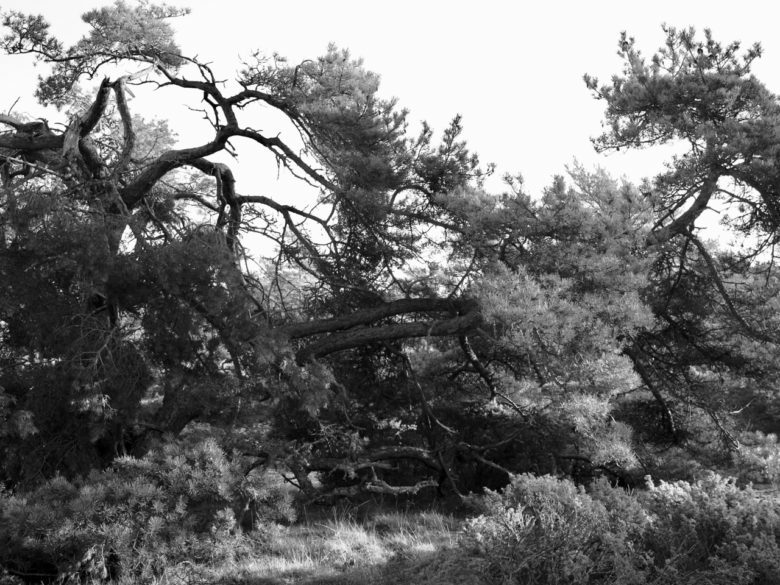 However, conditions in the archipelago are rough; trees must cope with strong winds and poor soil. Three peculiar trees, unique specimen, caught my attention. Their life stores have touched me, as an artist and human being. Studying their shape, I read about their lives and experiences, and how they reacted individually. I learn to know them as personalities, with their peculiar characters. 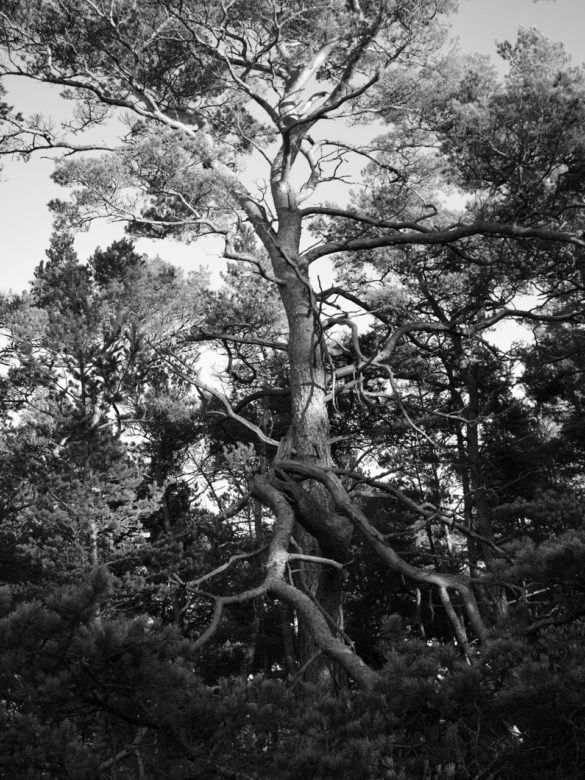 Trees communicate their life stories through their form and growth – a mode of embodied plant story telling. I often stayed for a longer time in the company of one of them. Observing the tree in silence, it becomes close to me, almost like a friend, but certainly like an individual that I know very well. The trees featured here have all been deeply wounded in middle age, most likely by heavy winds. Every one of them demonstrates remarkable resilience. With great admiration, I learned about their unique processes of healing and alternative modes of growth in adverse circumstances. In particular, I want to draw attention to this fallen tree. It lives on the north-western coast of Örö, close to the coat line. In this plant, I detect a universe of resilience. 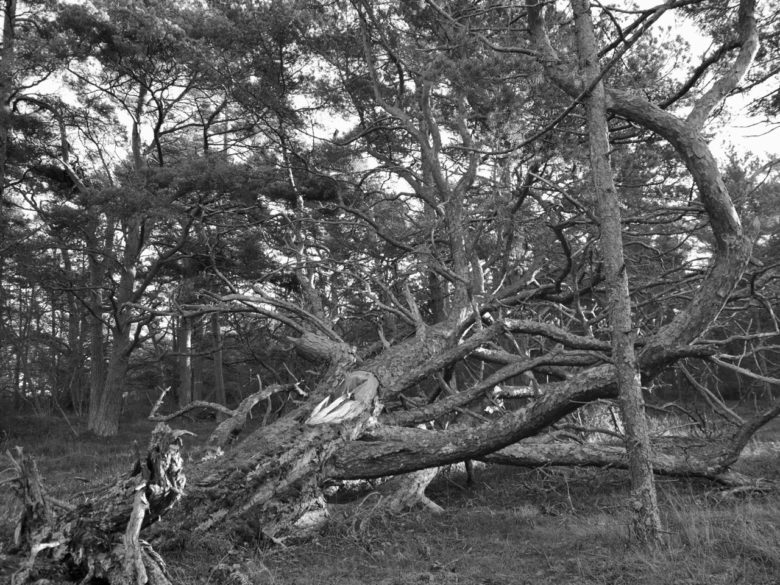 The tree was felled by a gale as an already mature specimen. 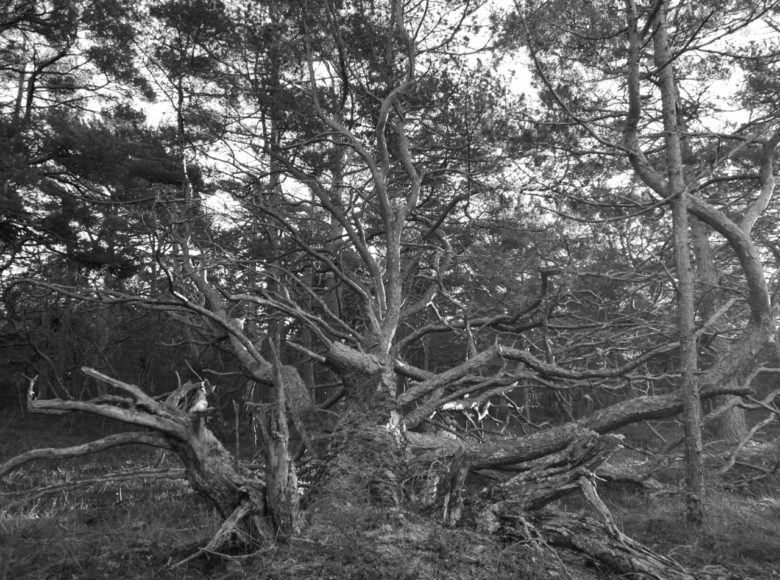 Yet, with only part of its roots still connected to the ground, it continued to grow. For many years, it expanded further, via the few major branches that happened to point straight up after the fall. The upright branches took over as substitute trunks. The problem of such ersatz trunks is their relatively unsafe anchoring. Without roots as support, they need other modes of stabilisation. Seeking for additional support, the lowest secondary trunk entered into a precarious relationship with a young tree growing close by. 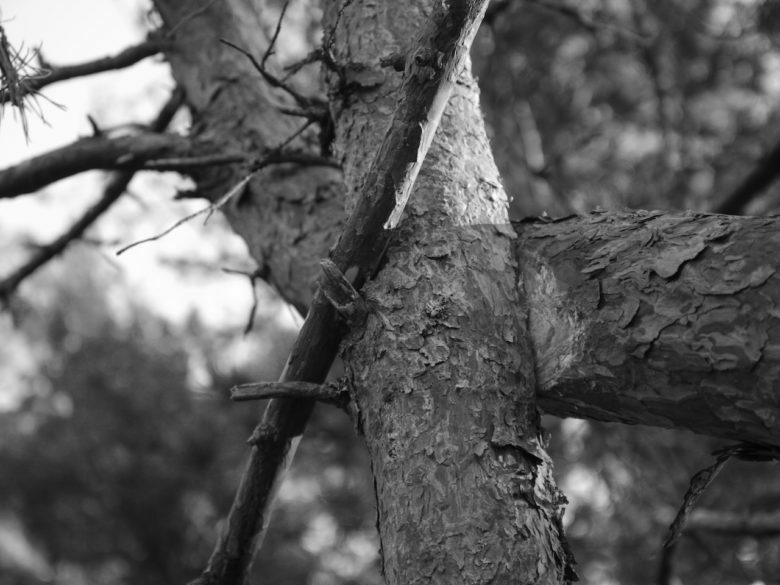 Over the course of years, the branch virtually circled around its tree partner. Like twins, both have currently grown to the same height. Very recently, the mother tree suffered yet another heavy wound. One of the strongest substitute stems was broken off by winds. Coming winter, will the mother tree survive? To ease the healing process, workers of the National Forest maintenance sawed off the severed branch. With Örö being so small, I come across the same places over and over again. Almost every day, I visit certain key spots and look at the same constellations of objects, rocks, or plants. An opportunity opened up to study certain processes and change. My experience is that my perception took another direction in the archipelago, intensifying over the duration of the month. Due to the external circumstance, it is not possible to extend perception into new territories or into new themes. Therefore, perception deepens. That is, rather than exploring the new, I look into details and differences that happen over time. Change as a process came to the foreground of my perceptional explorations. Repeatedly observing a specific object, over days and weeks, my perception began to take note differences that appeared with or around that very object. Such was the case with the trees featured here.